Make Your Check Payable to: "Acalanes 61"
Everyone is saying that this was the best reunion yet! We appreciate all of you who came and missed all of you who couldn’t. Maybe after reading about the reunion and seeing all the pictures, you will start planning on coming to our 55th reunion in four years. It will hopefully be a joint reunion between the classes of 1960, 1961 and 1962. More details to follow. The tour of Acalanes at 4 PM Friday, September 21st Fifty-one people signed up from our class for the tour on Friday, September 21st at 4 PM and it was wonderful. We were split up into smaller groups that were each given the tour by two seniors from the senior leadership team. I know my group wished that we had some of the things they have now but we also had things they don’t have like my Clothing classes and Drivers Ed. Now when you are assigned a locker as a freshmen, you keep the same locker for all four years, instead of changing lockers each year and having to learn all over again where it is. A lot of us had never seen the inside of the auto shop before and did not realize that Bill Haase had won a contest for the fastest time in putting an engine back together. Yowza! In the woodworking shop, again another place a lot of us never saw, they had fantastic handmade parquetry boards as well as bowls that the freshman had made. Students can also do metal work and jewelry making. The environmental science class has planted and maintained an organic garden plot. The tennis courts, baseball field and football field have all been redone and upgraded from our time and the pool is huge. What we had for dances, assemblies, basketball etc. is now called the little gym. The new gym is fantastic and so is the theater. It is such a professional venue to have on the school site for all of the musical, dance and play performances. If you can ever go on a tour, take advantage of it. El Charro at 5 PM Friday September 21st We had 44 from the class of 1961 at El Charro and with the class of 1962 we had over 100 classmates and spouses/friends at both the tour and El Charro. El Charro was a no host dinner and drinks, and you could stay as long as you wanted mixing and mingling with everyone. Classmates had a great time seeing and talking to people they hadn’t seen in many years. The Reunion at 6 PM, Saturday, September 22nd Over 103 classmates and spouses/friends went to the reunion from just our class. When you arrived at the Hilton you were directed to our ballroom where there were greeters with name tags ready for everyone and his or her guest. When you received your name tag you were encouraged to have your portrait taken. 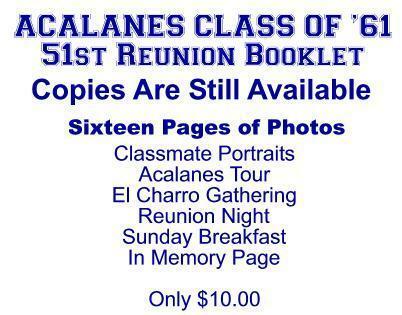 The portraits will be put into a booklet along with your class picture, in memory photo and other photos taken of the tour, El Charro, the reunion and the breakfast. Another table had a mockup booklet for $10.00. If you did not purchase one at the reunion you will be sent out information about ordering it. There was a donation jar to keep our fantastic website running and we collected enough money to keep it running for a few more years– YEAH ! Thank you everyone that donated and you can continue to donate. There was a no host bar and a buffet style dinner that had five stations to choose from. The first station had an assortment of veggie’s and cheeses with ranch dressing for the veggies and baguettes and crackers for the cheese. The second station was an Italian station with pasta with condiments, brochette and pizza squares. The third station was seafood with crab cakes, smoked salmon, peeled shrimp, and scallops, and skewers of chicken and shrimp. The fourth station had a potatini bar of mashed potatoes with chives, bacon bits, sour cream and gravy served in a martini glass. The fifth and final station was a carving station of rib eye beef and turkey, after dinner the carving station became a dessert bar of chocolate dipped strawberries, mini cupcakes, éclairs and pies. There was oldies music playing throughout the evening. After dinner Dave Dornsife and Sunny Edwards Nunes from our class spoke for a few minutes along with Chip Hollister and Susan Frazell Sperry from class of '62. We also had a class photo taken. There was also a memorabilia display of all of our classmates with red hearts on the picture those who have died, and a blue question mark on the classmates that we have not found, a framed picture of our classmates in memory, a picture of John DeGroot in the Don costume, the Lafayette town hall basement kindergarten classes, the 40th year reunion picture, one of our basketball schedules, a tribute to Mr. Steven's that Jan Roddick wrote and framed and numerous other items of interest back then. There were some tables for sitting and bistro tables for standing so everyone could move around mingle, socializing and see as many of our classmates as possible. Renewing friendships and making new ones, remembering classmates, learning what people had been doing, what they are doing, who has traveled, where they moved to and where they live now was very interesting. Check your mail from Raines Video Productions who took a video of the entire reunion, interview everyone that they could, captured the dancing, the picture taking, speeches and anything they saw of interest. They have a list of available videos to order and a return envelope to use for your convenience. Kindergarten Breakfast Reunion at 9 AM, September 23 -The breakfast was open to everyone in our class and the class of 62 who wanted to come, kindergarten at Lafayette town hall not required. It was held in the Plate & Vine at the Hilton. Most of the class of 61 pushed tables together outside on the patio so we could have a large group eat together since inside the seating was limited to 4 to a table and you could not socialize as well. The breakfast was a nice ending to the reunion, seeing people again and saying goodbye until we meet again. All in all a good time was had by all, but we missed those who couldn’t come. Please make sure you check out our website at Acalanes61.com, look at all the reunion pictures posted. 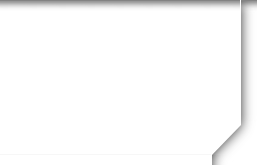 More and more pictures will be added as you send them in. We will also begin to up-dated messages on the next reunion, the list of our missing classmates that we need help finding, etc.